Stepping from the South Station platform onto the 8:05 a.m. commuter train to Plymouth and Kingston - one of the weekend trains the MBTA plans to eliminate - Carol Payne of Rome, Ga., noticed that something seemed missing: passengers. The answer, according to the T, is a lot more than ride the train now. The train the Paynes rode to Plymouth for sightseeing Saturday could have been an exhibit for the T’s cost-cutting plans. Four of its five passenger cars were closed off. At peak, the Paynes were two of only 13 passengers sitting in the more than 180 seats available in the sole open car. By comparison, business was booming on the 11:20 a.m. train north from Kingston to South Station, which had 55 passengers at one point. Still, they filled only a fraction of the more than 900 seats that could have been used in the five cars. Another kind of math is at work for some passengers, though. While few ride the three commuter lines where weekend service is slated to be eliminated, some use the trains to get to and from work. For those passengers, loss of weekend service would do more than interrupt a tourist excursion. Another passenger on the northbound train, Olivia Brownlee, brought a bicycle for her commute from home in Rockland to work in South Boston. 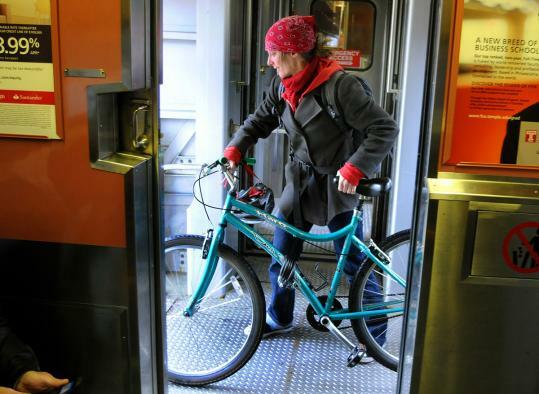 Brownlee - who bicycles to the Abington commuter rail station, rides the train to South Station, then takes the Red Line the rest of the way - will have to make an expensive switch if the weekend service ends. That isn’t an option for all passengers, however. Heading south to work Saturday morning, Brett Carey of Abington said losing weekend commuter rail service might mean trying to find new employment in a tough economy. As part of a budget-balancing package of fare increases and service cuts announced last week, the T said it plans to end weekend service on three commuter rail lines: Plymouth/Kingston, Greenbush, and Needham. The three have the lowest average number of riders on weekends among the T’s commuter rail lines, even though numbers shoot up occasionally. “The last time I took it was for the St. Patrick’s Day parade in Boston, and this train was packed,’’ said David Becker, who moved to Plymouth from Cambridge 16 years ago and takes the train infrequently. But an occasional packed train isn’t enough, according to the T.
The Plymouth/Kingston line has eight inbound and eight outbound trains on Saturdays. The line averaged 1,357 passengers on Saturdays from 2009 to 2011, according to T figures. In 2009, about 4,900 people used the line on a typical weekday. On Saturdays, Greenbush gets an average of 1,132 passengers and Needham 882. At the top of the list for Saturday passengers is the Providence line, with an average of 5,801. All Saturday counts took place between 2009 and 2011, according to the T, and crews noticed no significant changes since the numbers were tallied. Passengers who luxuriated in the space available on the almost-empty trains this past Saturday were sympathetic to the T’s financial needs, but some suggested options other than eliminating weekend service altogether. “What if they reduced the number of trips?’’ asked Chris Vanoss of Plymouth, who was traveling into Boston with Shawn Wise of Kingston and Shawn’s young son, Devin. Fewer trains would still provide a commuting option for Maryann Hughes of Falmouth, who sat across the aisle with her 6-year-old granddaughter, Kasey Boettger. They take the line into Boston once a month for a weekend outing. While it lasts, the option of a weekend commuter train system was the envy of tourists such as the Paynes, who were in the area to see their son, a Harvard University graduate student.